If you are a Christian, you are a World Christian. Rather, you should be. As part of my preparations to lead a workshop at the International Conference on Missions (ICOM) in November 2018, I read a fascinating book entitled, “The Abrahamic Revolution” by Todd Ahrend. The author emphasizes that the Bible is missional; in other words, from the very beginning of creation, God implemented a plan to win the world back to Himself. That means every part of the world. Every nation. Every ethnic group. As one reviewer said, “[It is] the Church’s responsibility to make Christ’s last command our first commitment.” That last command, known as the Great Commission articulated in Matthew 28:18-20, is to go into all the world and make disciples in every nation. Arhend shows how this theme threads through the entire Bible. He categorizes the major religions of the world and what they believe to give a taste of the nations we must try to reach. Finally, he emphasizes that this task belongs to every Christian, not just a few front-line, on-the-field missionaries. At one point, he makes the bold statement, “God doesn’t want Christians; He wants World Christians. You can be a World Christian anywhere. A World Christian seeks ways to pray, give, mobilize, and support any effort to bring the gospel to any nation, tribe, or ethnic group. A World Christian bears witness to anyone who is different, whether race, gender, physical ability, morality or religion. When we become a Christian, we sign on to pass it on. I’ve heard a lot of moaning and groaning over the years of how sad it is that the Bible has been taken out of the public schools and that this is the cause for the downfall of our present society. If the Bible was only put back in the schools, all would be well. Let me propose something else and yes, this has to do with World Christians. What if the church and Christian families did a better job of rearing children to become World Christians? What if we trained the young people we do have to become missionaries in the public school? Imagine the impact on the public school system if there was a large dedicated group of students in the public high school determined to live out their faith to the extreme? What if more churches were serious about passing on the baton of their faith? How would that impact their neighborhoods, communities, stores, the government? I think a lot. Will there be kickback? Oh yes. You can count on it. Satan always roars when he feels threatened. Will there be casualties? Sadly, yes. When we – or our children – try to pull others up, they will resist and attempt to pull us down and unless you’ve got combustible engine force power, gravity will win. That shouldn’t mean we don’t try. Fortunately, God’s power is exponentially stronger than any solid rocket booster. The Church doesn’t need Christians. The church needs World Christians, people who care that the message of Jesus Christ is relayed to all people, no matter who. 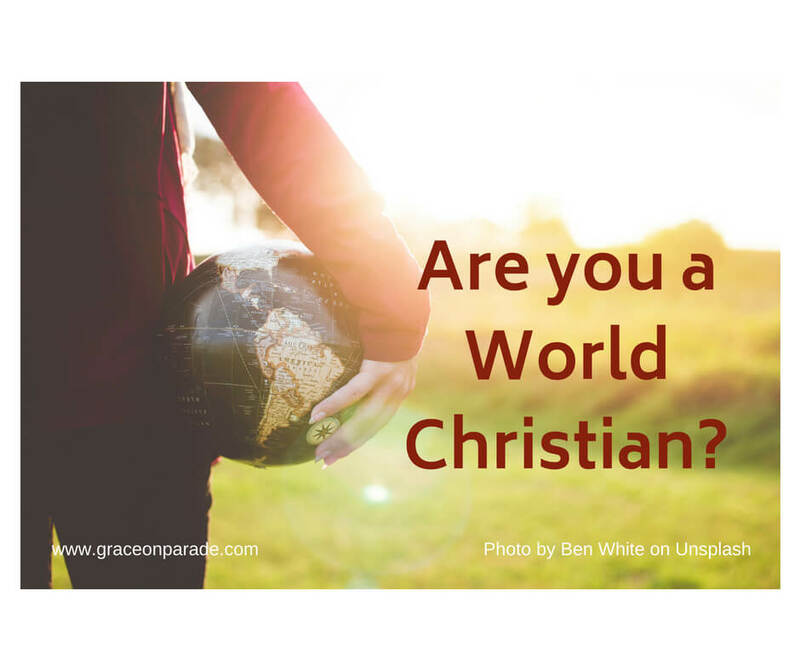 How are you living the life of a World Christian? Identify the people in your inner circle who don’t have an active faith relationship with Christ. Pray for those people daily. Identify someone you know who is working with people from another culture. Message them, asking how you can support what they do. View everyone you meet as someone who may not go to Heaven when they die but who needs to. Gather the young people who attend your church. Ask them to give names of teachers and fellow students who are unbelievers. Challenge them to pray with you for those people and to ask God how He might use them to bring the message of Christ to those unbelievers. Then ask them to name teachers and students who have some semblance of faith in Christ. Pray for them, that God might strengthen them and embolden them to become World Christians as well. How will you live as a World Christian today? **NOTE: I am not an affiliate with any company. I receive no kickback from the books or organizations to which I provide links.